Lets Practice! Look at each cow and think about the parts of the Unified Scorecard. 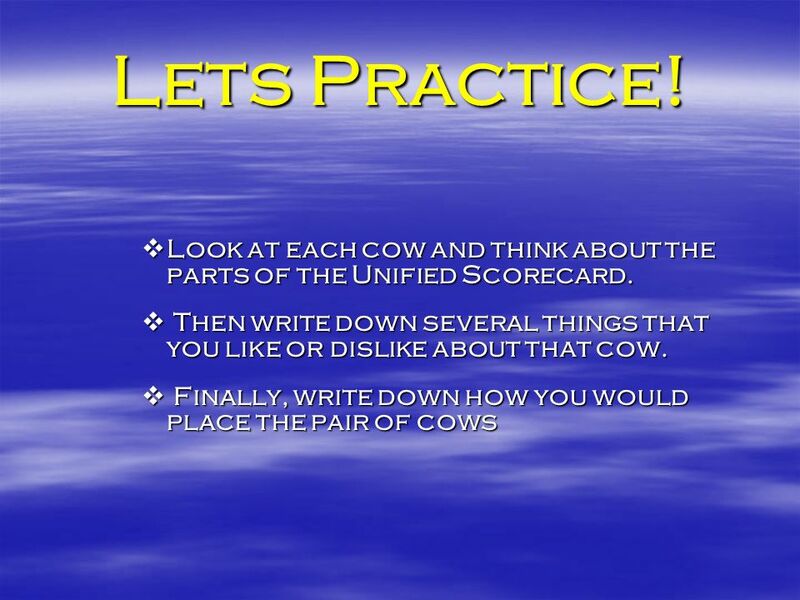 Look at each cow and think about the parts of the Unified Scorecard. 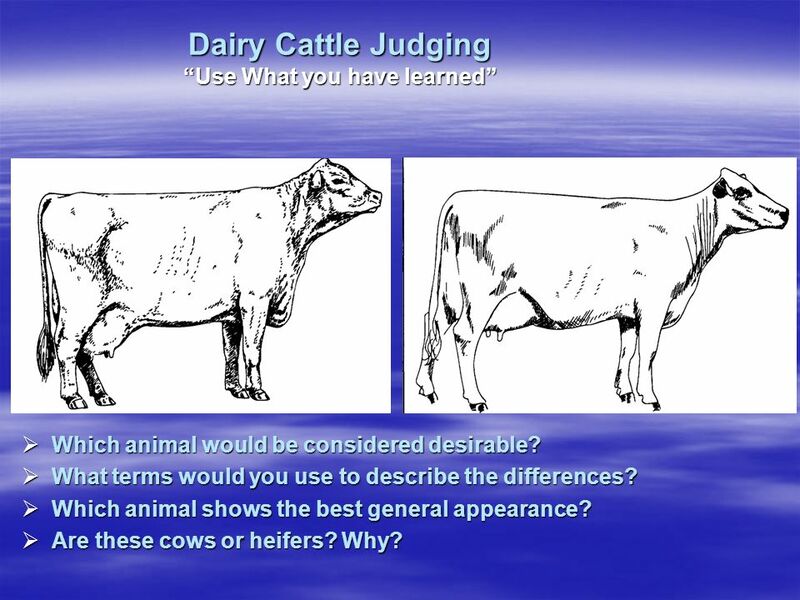 2 Dairy Cattle Judging Use What you have learned Which animal would be considered desirable? Which animal would be considered desirable? What terms would you use to describe the differences? What terms would you use to describe the differences? Which animal shows the best general appearance? Which animal shows the best general appearance? Are these cows or heifers? Why? Are these cows or heifers? Why? 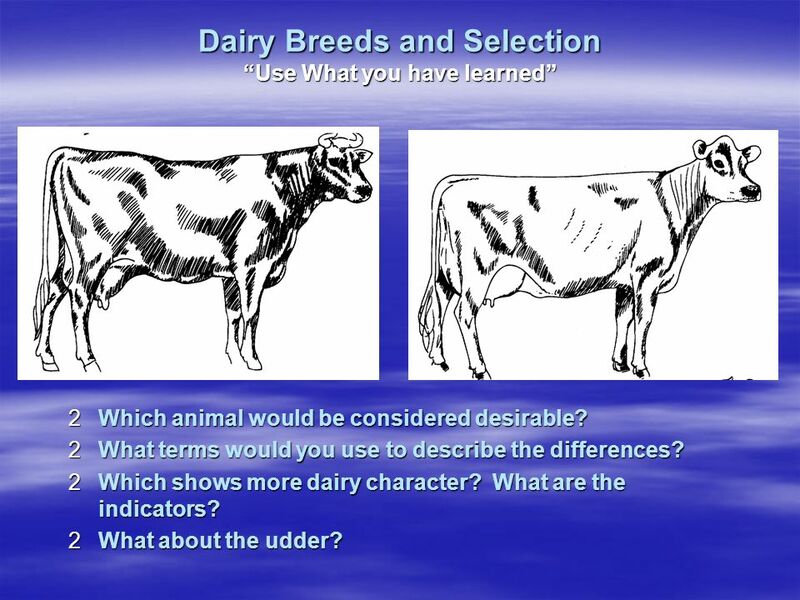 3 Dairy Breeds and Selection Use What you have learned 2Which animal would be considered desirable? 2What terms would you use to describe the differences? 2Which shows more dairy character? What are the indicators? 2What about the udder? 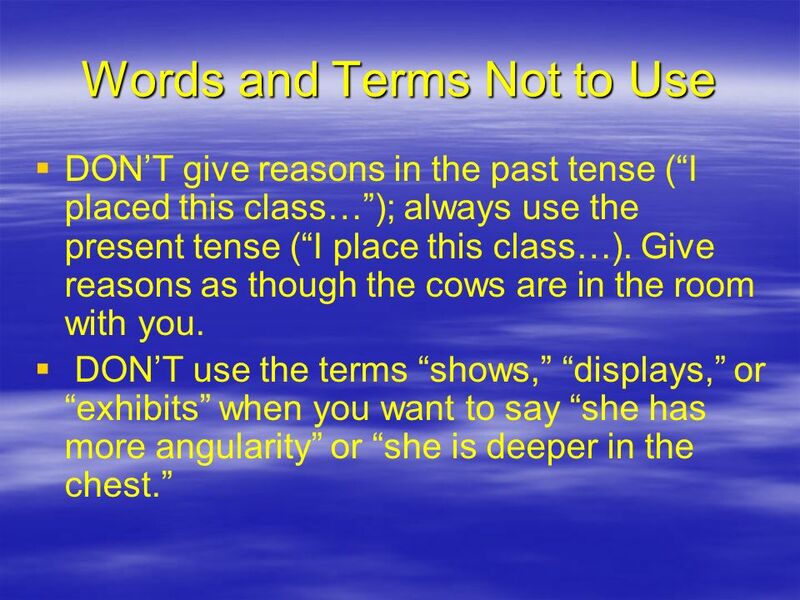 8 Words and Terms Not to Use DONT give reasons in the past tense (I placed this class…); always use the present tense (I place this class…). Give reasons as though the cows are in the room with you. DONT use the terms shows, displays, or exhibits when you want to say she has more angularity or she is deeper in the chest. 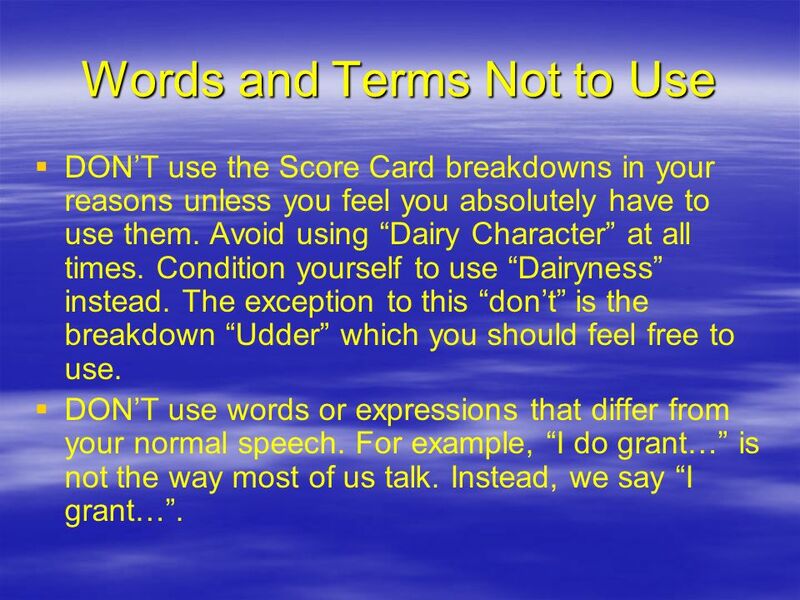 9 Words and Terms Not to Use DONT use the Score Card breakdowns in your reasons unless you feel you absolutely have to use them. Avoid using Dairy Character at all times. Condition yourself to use Dairyness instead. The exception to this dont is the breakdown Udder which you should feel free to use. DONT use words or expressions that differ from your normal speech. For example, I do grant… is not the way most of us talk. Instead, we say I grant…. 10 Words and Terms Not to Use DONT use terms that are redundant (unnecessary). 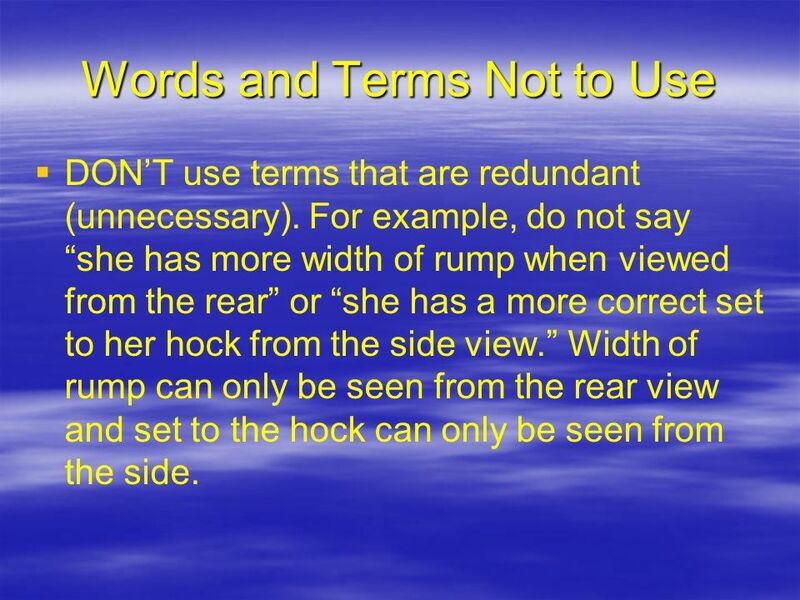 For example, do not say she has more width of rump when viewed from the rear or she has a more correct set to her hock from the side view. Width of rump can only be seen from the rear view and set to the hock can only be seen from the side. 11 Words and Terms Not to Use DONT overuse the word today. When you say, she has more stature today, you infer that she might not have more stature next month. Thats very unlikely. You may want to use today with terms like dairyness which might change in a month. DONT use the word number when identifying a cow. 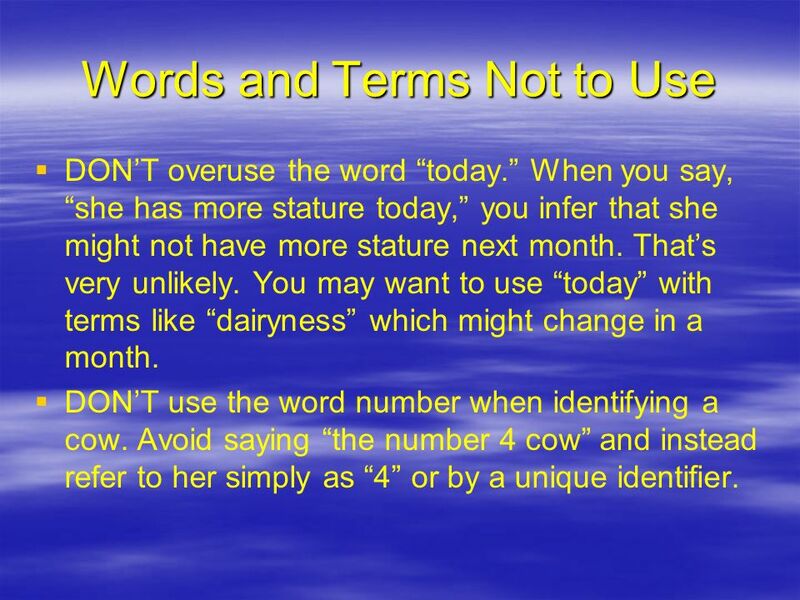 Avoid saying the number 4 cow and instead refer to her simply as 4 or by a unique identifier. 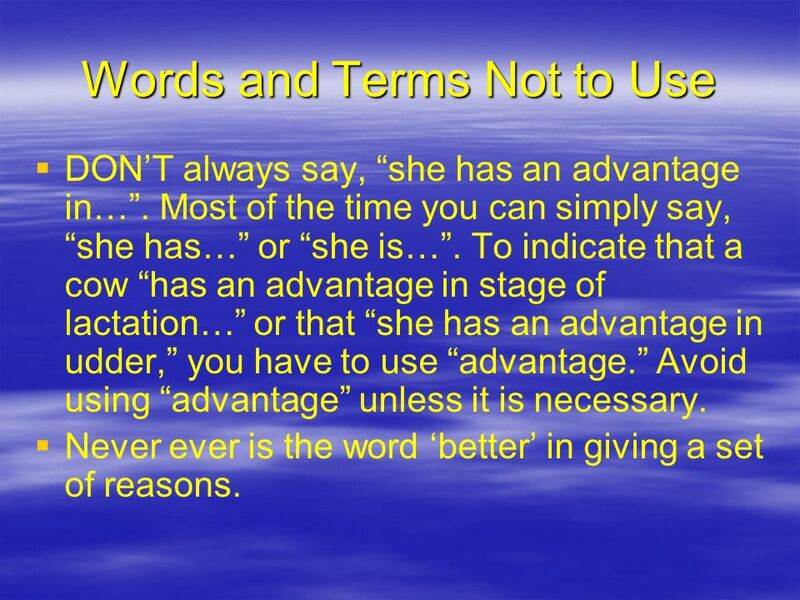 12 Words and Terms Not to Use DONT always say, she has an advantage in…. Most of the time you can simply say, she has… or she is…. To indicate that a cow has an advantage in stage of lactation… or that she has an advantage in udder, you have to use advantage. Avoid using advantage unless it is necessary. Never ever is the word better in giving a set of reasons. 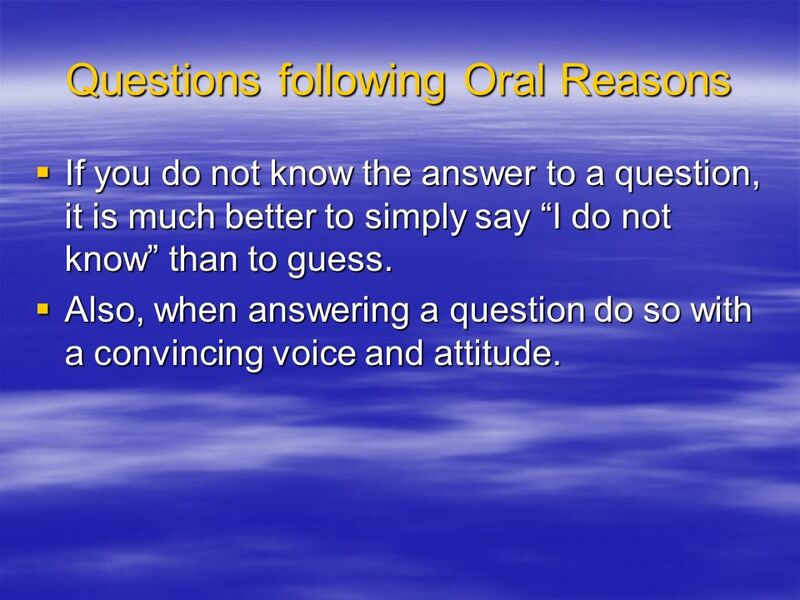 13 Questions following Oral Reasons Reasons why reason taker asks questions. 1.To clarify a point you made in your reasons 2.If you missed an observation that should have been included in your reasons 3.To see if you have a mental image of the class in your mind. 4.To challenge you to see if you will change your mind regarding a placement or observation. 14 Questions following Oral Reasons If you do not know the answer to a question, it is much better to simply say I do not know than to guess. If you do not know the answer to a question, it is much better to simply say I do not know than to guess. Also, when answering a question do so with a convincing voice and attitude. Also, when answering a question do so with a convincing voice and attitude. Download ppt "Lets Practice! Look at each cow and think about the parts of the Unified Scorecard. Look at each cow and think about the parts of the Unified Scorecard." Business Phone Etiquette. The Telephone and You Provide helpful hints and proven techniques Provide helpful hints and proven techniques Part of doing. Being a Good Listener. As a good audience… Being concentrated. Listening carefully. Responding properly. Evaluating objectively. Judging Contests 101 Running a Successful 4-H Judging Contest Kevin Kline, PhD University of Illinois. Judges Briefing The American Legion High School Oratorical Scholarship Program. Joe Bostwick BMCC ANS 231. The selection of these heifers is based on breeding purposes. This will be a commercial Sim/Angus ranch choosing replacements. Beth Morrison Youth participation in judging will provide multiple benefits in addition to the skills learned in the project area. Present Continuous Use, form and exercises. FORM [am/is/are + present participle] Examples: – You are watching TV. – Are you watching TV? – You are not. Note Taking and Preparation for Oral Reasons Equine Science Spring 2010 Created by: Bryan Egan and Stacie Domer Penn State, 2006. 2014 Mail-in Tournament Month 2: Swine.  Make sure you have a pencil and judging card ready o Don’t forget to include your full name!  You may take.  You may be the first person a caller talks with, so it is important to represent the company well!  Every call is an opportunity to enhance customer.